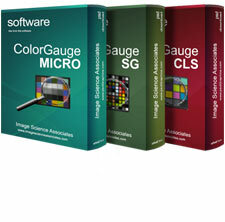 Designed for customers who need to verify their compliance with existing color spaces, the ColorGauge Color Analyzer suite implements world-class image processing algorithms to provide simple, accurate feedback on the image quality performance of your system. It works on TIFF and standard JPEG from images captured of the 24-patch X-Rite ColorChecker® Classic, Digital ColorCheckerSG, and all sizes of ISA’s ColorGauge small scale color targets. ColorGauge Classic Analyzer Technical Documentation. ColorGauge SG Analyzer Technical Documentation. ColorGauge Micro Analyzer Technical Brochure.